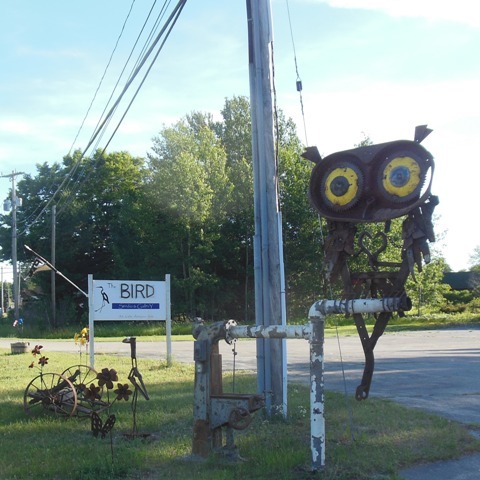 When Rod and Mira Bell heard that Eastport’s old township hall was on the market again, it struck them as just the place for their Bird Studio and Gallery. 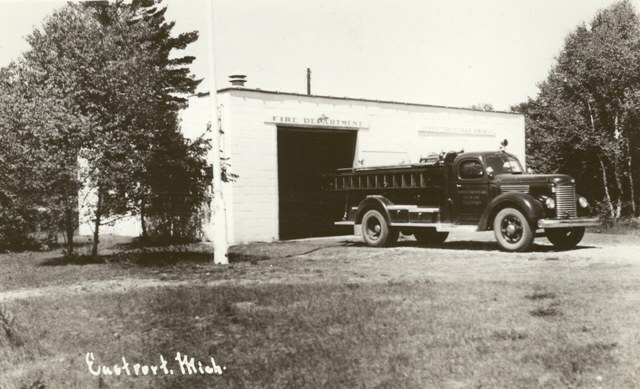 The building began life as the Upper Torch Lake Association firehouse shortly after World War II, which intimidates the Bells not at all. They like applying creativity and elbow grease to Old Stuff to transform it into intriguing New Stuff. Where better to display the Steampunk Singer, the Word Organizer, or the Saw-Whatnot Owl to best advantage? Not to mention the useful vintage trunks and oil lamps and . . . other things we could not identify. This place will get your brain whirling in a good way. My very favorite piece was the Word Organizer, a bookcase Rod crafted for his daughter and embellished with a bouquet of recycled typewriter keys . . . but that’s just me. You’ll find your own favorite. I don’t see how you can go wrong. And now, just because I’m in a wicked little mood . . . three images in the block of nine are ringers from the walls of the Writing Studio and Bait Shop. See if you can figure out which three. The answer will appear in the next post. Eventually. I think the ringers are the three pictures of bugs — first and third on the top row and middle on the bottom row. The “Saw Whatnot Owl” made me chuckle. Well good morning Early Bird. I liked the owl, too. I confess I gave him his name, even if he does have ears. Hmm. Maybe I should have dubbed him the Great Saw-Whatnot Owl. I digress. Thank you for playing the game. Bugs indeed. I don’t think I can guess which photos are your ringers, but I must say, I think you could have used many of these for my whimsy photo hunt last month! Love that big ol’ owl at the bird gallery and find him quite whimsical! Pretty much everything I do has a touch of whimsy. I think whimsy is often the starch in my spine. I’d say left and right on the top row, and the middle photo on the bottom row. For some reason, they look like they might be collected feathers or hand-tied lures. I’d be happy to visit the place, for sure. I’m a great fan of oil lamps, for one thing. I’ve a tiny collection of the miniatures. I’d have a big collection if I could afford it. Today’s big adventure is fig-picking. I hope you find something equally pleasurable there in the far north! I had a little oil lamp that I loved – a metal base, very good light – but I broke the whatchamacallit, the glass flameguard thingy, and could never find a replacement that fit. I have enough big oil lamps now, but I do miss that little one. There are some excellent adventures planned for this weekend. Have fun picking figs. Send me the bottom diameter of the chimney, and I’ll see if I have one in my stash. I’ve got a whole box filled with old glass chimneys — redundancy, and all that. If I’ve got one that will fit, I’ll send it to you. Well that is mighty thoughty of you Linda. Thank you. I believe the little lamp (base) is over at Louan’s, as she goes to many more interesting places than I do and finds such things as glass chimneys (that’s the word, chimney – I forget everything). Neato! A finger lamp! I recognize the burner style. I’ll dig my box out of the closet in a bit and see if I can at least match the shape. But we do need the OD (outer diameter) of the chimney. If I can find one with the right diameter, even a slightly shorter/taller/fatter/skinnier chimney would do. Progress. Before you go to too much trouble, let’s see if Louan still has the lamp base . . . and can find it. The “Inchies” are back. That’s remarkable! And Carsten reappears – that is even more remarkable. I thought of the Inchies when I was trying to figure out how to convey the whimsical range of delights at the Bird Gallery . . .
Now see? There’s ANOTHER place I want to visit up there! Don’t know which are ringers..guess I’ll mosey on over to the next blog post to see. See, that’s our plan. We tell people little bits and pieces, just enough to make them want to come back.